Introduction to series: In this series we are going to take a look at three of the common gifts that God gives to all of us. He gives these gifts in different forms and measures, but we have all been given these gifts. We are going to look at how these gifts point us to God and how they only find their proper place as we understand that knowing God is the supreme gift. To do this, we must see the greatness of Jesus Christ in relation to these three gifts. Each weak we will look at a gift – how we enjoy that gift without letting it replace God – and how Jesus is great in relation to this gift. First of all, we are going to look at time. There are many directions we could’ve went with this message but I want to specifically look at the time we have been given as Youth. I still consider myself in this category (although after waking up in soreness for two days following the Dodgeball Tournament, perhaps I should remove myself from this category). I want to look specifically at a passage that talks about our years as youth and gives us some wisdom as to how they are best spent and why they are a gift. See what these two songs are saying – You’re going to die at some point, so enjoy your youth. Live life to the fullest while you are young because eventually you’re going to grow up and die – you decide what living life to the fullest mean. The Preacher of Ecclesiastes says the same thing. He says enjoy your youth because eventually you will get old and die. He just has a completely different – and much more balanced understanding of what it means to enjoy your youth – God decides what it means to live life to the fullest. 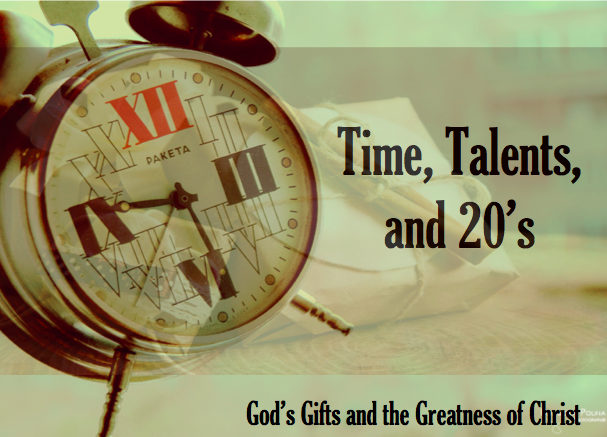 Big Idea: The time we have as youth is a gift God has given us to enjoy life and to enjoy Him as our life-giver. The Preacher’s first word in 11:9 is to Rejoice. Enjoy the years of your youth. Let your heart be happy. Walk in the ways your heart desires and your eyes see. Sounds a whole lot like hedonism – pleasure is the greatest good – live your life to minimize pain and maximize pleasure. Eat the steak instead of the tomato everytime. True Christianity should have a similar ring to hedonism. The difference is that God, not we, decide what pleasure is. He puts good boundaries around pleasure and tells us that knowing Him is the greatest pleasure. Our years of youth are full of dreams and plans for the future. We are planning our lives, figuring out our passions, and making many decisions. We can enjoy opportunities that only come with youth – I.E. Taking a road trip on a whim. Moving to another country for a year or a semester. We should rejoice in these things and enjoy this period of life. But the preacher reminds us that we should not pursue “pleasures” outside of God’s rule. He has declared what is good and what is not. And if we determine we will pursue pleasure in ways that he has not declared good – in ways that are twisted – we will end up finding pain and trouble, and anxiety. And we will be walking in opposition to a God who holds all people accountable. This is not a threat, but a reminder. But we say, Jesus forgives me and makes me righteous – YES, but that is not an excuse to live foolishly. Living our youth pursuing sin can lead to greater pain, trouble, and anxiety in our lives. Example: I can say because I’m young and only have one life to live I’m going to stop sleeping because that will help me to enjoy life to the fullest. So I’m going to stay awake all night long. And after the first night I feel okay. Even after the second night I may feel okay. But, when I start seeing grizzly bears walk past me in the hallways in school on the third day, I’m going to realize something is not right. If we pursue desires and pleasure outside of God’s plan there will be consequences – its not wise. Just as there are consequences for me deciding not to sleep. Its not wise. First, There are things in your life that you cannot remove. There is pain that you have not caused. There is anxiety that may be brought about by the expectations of others. There is trouble that you never asked for or expected. All of us have experienced pain, trouble, and anxiety that we did not cause or ask for, but there is also pain, trouble, and anxiety that we cause ourselves. The first way we cause this is by pursuing enjoyment outside of God’s good commands. We also do this by holding in problems we face, rather than going to friends, trusted mentors, and ultimately to God in prayer. We cause ourselves unneeded anxiety by placing too much pressure on ourselves or by being pulled in to many different directions. Remember the God who created you while you are still young. “Remember” here is be mindful of God in every circumstance. It is to live in relationship with him and commit ourselves to him. Solomon is saying that the essence of not wasting your time as a youth is to remember God now. To worship Him now. To pursue knowing Him now. To waste your time as a youth is to walk through life as if God doesn’t exist. Example: You were created to enjoy and know God. Think about something you are really good at… maybe its playing soccer, maybe its painting or drawing, maybe its building things or figuring out how certain things work, maybe its eating pizza and drinking soda. If you realize you are good at soccer and enjoy playing soccer, you’d be foolish to say to yourself, well I’m just going to wait until I’m 18, 21, 24 to start really playing. No, your youth is one of the best times to explore and develop this talent. Yet for some reason we often think youth is not the best time to know God and begin to enjoy Him as our creator. If we push this off till we’re older, we miss out on the greatest joy and pleasure that we could have had during those years. Because we were convinced that following God actually means being boring and saying no to happiness and pleasure (which is a huge lie – the opposite is true). How do we remember God in our youth: Let knowing Him be your greatest pleasure. All other things that are good and enjoyable in this world should point us to Him. As you play sports – realize how wonderful amazing it is that God has gifted you with the physical ability to play sports. As you spend time drawing and painting and taking pictures – recognize how awesome it is that God gives beauty in this world and creativity to capture that beauty in pictures. As you spend time reading – praise God that he has given you a mind to enjoy books. Praise him for good authors, for the enjoyment found in reading good fiction. As you plan your future – both a month from now and 10 years from now – bring your plans before God in prayer. Think about how your plans will glorify him as you set out in a certain direction. Resurrection – Death is coming, but it is not final because Jesus beat death. We hate to talk about death in the modern world. We think that if we avoid it as much as possible it will stay far removed from us. Solomon seems much more comfortable addressing death, but no less convinced of its tragic nature (12:6). Death is tragic no matter when it takes a person. There is something far more tragic about a young person being taken by death. We live with the constant knowledge that death is looming somewhere over the horizon. Example: It’s like the thunderstorm you hear in the distance. You here its rumblings and perceive its distant lightning’s. Sometimes it seems closer. Sometimes it is closer for one person than for another. But it remains there constantly. But for the Christian death is not final. We know that death will give way to a beauty and brightness far greater than we could ever dream or imagine. It is a tragic leaving, but it is also a joyful homecoming. Christ came and submitted to most unnatural of deaths. God in the flesh dead. But, he got the final word over death, and because of that we know that we too will have the final word over death. Because he took on human nature and died we will rise and take on his glorified nature. That is good news for the 80 year old and the 18 year old. It’s good news for the person who knows God at a young age. And its good news for the person who comes to know God at a very old age. Both are told that in heaven they will be forever young. Spend your life pursuing pleasure in line with God’s will. Live in relationship with God while you are still young and use godly wisdom to direct your dreams and paths. View aging and death through the lens that says, “They are not the final words!